Francisco Da Costa Santos Wins Event #6: €1,650 Six-Handed Pot-Limit Omaha (€83,275)! The final table of the €1,650 Six-Handed Pot-Limit Omaha event started with just five players, but winning was far from an easy task for Francisco Da Costa Santos. A long, hard-fought battle, between Santos and his four opponents, resulted in the first-ever bracelet for Portugal, as he walked away with the €82,275 grand prize. The very first hand of final table play resulted in an all-in shove from Petteri Kalenius. He challenged Santos, but the eventual winner decided that it wasn't the right moment. This was the mantra of the final table as we didn't see any bustouts in the first three hours. Short stack Petteri Kalenius doubled up in one of the first hands, giving a big blow to Andrew Lichtenberger's stack. The chip leader going into the final table struggled the entire time, making him eventually bust out in fifth place. On his final hand, he got all his chips into the pot with against Aku Joentausta's . The board ran out , and the most accomplished player at the final table was gone. Lichtenberger added €18,463 to live tournament earnings for his finish. Thirty minutes after Lichtenberger had been eliminated, it was time for Santos to turn the tables on Joentausta. The young Finnish player had been in control for quite some time, but that rapidly changed when he played the biggest pot of the tournament against Santos. In a pot worth 525,000 chips, Santos showed against Joentausta's . The dealer ran out , and Joentausta was left behind with little chips. Santos showed real emotions and almost danced around the table in excitement. Ana Marquez, who had been quietly grinding her below average stack, was the one who took out fourth-place finisher Kalenius. 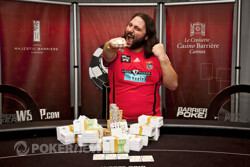 The Spanish pro raised to 20,000 under the gun and Kalenius defended his big blind. On a flop, Kalenius check-raised all in and Marquez called with . She was up against , and after the turn, the , and river, the , it was all over for the Finn who took home €25,831. The other Finn, and youngest player at the final table, was next to go. Joentausta was short and moved all in with . Santos showed , and he flopped a winning straight when the board brought . The heads-up match began with a massive 742,000-chip stack for Santos while Marquez had only 187,000. The heads-up match started after the dinner break, and lasted just 13 minutes. Marquez was in search of a quick double up and got her money in with . Santos went for it with , and made history when the board ran out . Santos fell to the floor, shed tears, hugged his girlfriend Mariana and was most of all just very, very happy with what he had just done. He walks away with the €83,275 first-place prize and the first-ever gold bracelet for Portugal. 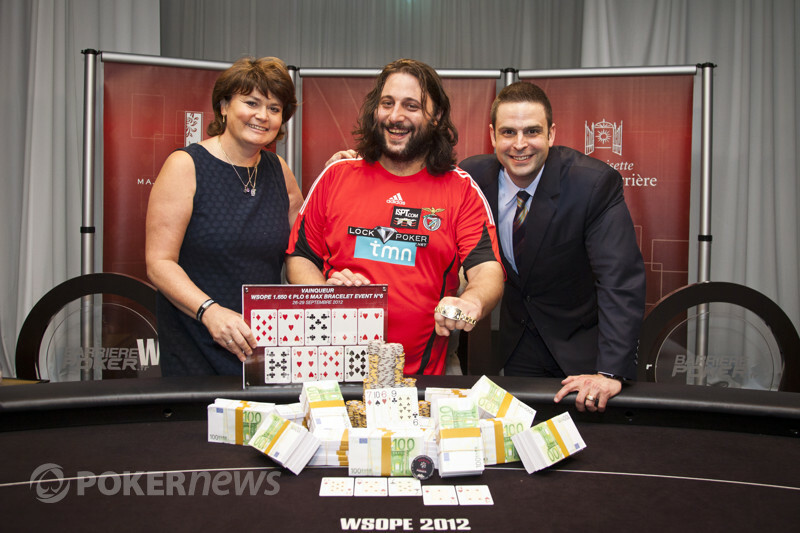 Although this event has come to a conclusion, the PokerNews WSOP Europe coverage isn't over. It's currently Day 3 of Event #5: €10,450 Mixed Max - No-Limit Hold'em and Day 1a of Event #7: €10,450 No-Limit Hold'em Main Event, so be sure to head over there to see what's going on. Francisco Da Costa Santos is your Event 6 winner! The heads up was short and fast-paced, but there was no stopping Francisco Da Costa Santos. 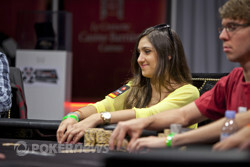 Ana Marquez got her final chips into the pot pre flop, creating a big showdown. The board ran out , and Da Costa Santos took down the first ever Portugese bracelet. Ana Marquez took second place but seemed just as happy with her result. Francisco Da Costa Santos raised from the button to 20,000 and Ana Marquez called. The flop showed , and Marquez check-called 18,000. On the turn the hit and Marquez check-folded to a 30,000-chip bet. Santos draws first blood, and he extends his chip lead some more. The cards are back in the air with three minutes left in the level. PartyPoker have launched a fantastic promotion that will see someone — hopefully you — walk away with two tickets to the Manchester United versus Braga UEFA Champions League match on October 23, 2012, plus expenses thrown in for good measure! The lucky winner of this promotion will receive two tickets to the match, travel expenses and Legendary Treble Suite hospitality. In order to have a chance at getting your hands on this fantastic prize, all you have to do is share a screenshot of a poker hand on the PokerNews Facebook Page. Really, it's that simple. Play poker at a real-money table on PartyPoker during September 24 and October 7, 2012, and be prepared to take a screenshot of anything you think may be interesting. If you are involved in a hand that is a huge cooler, then take a screenshot of it. Have you just witnessed a horrible bad beat? Then share it with the world. The owner of the screenshot with the most likes will win the package. All we ask is that the screen shot be at least 800x600 in resolution and that it has all of the core elements — username and hand number — recognizable, that the action the screenshot is portraying takes place between September 24 and October 7 and that the screenshot is genuine and has not been altered regarding its content. Only the player who played the hand in the screenshot is allowed to share the picture and therefore eligible for the prize. PokerNews would like to wish you all the very best of luck and we cannot wait to see the images that you submit! Heads-up play will start at 8:00 PM local time as the two remaining players decided to take a dinner break. Can Lichtenberger Seal The Deal? Francisco Da Costa Santos with this lady after his vicotry..
Ana Marquez heads up against Francisco Da Costa Santos.